Hello Everyone, thanks for stopping by today. Here in Maine we got a little snow a few days ago but then it turned to rain and in my area it is gone – I am really not looking forward to winter it lasts way too long! My post today uses Susan’s Garden Notes Amaryllis and Potted along with Els van de Burgt’s new Holiday Garlands 1. Let’s get started. Cut off white cardstock 6″ X 12″ score at 6″ and fold on score line forming your 6″x 6″ card base. Ink all edges (Vintage Photo Distress Ink used here). Cut Patterned paper 6″ X 6″ ink all edges with same ink. Using Clear Double Sided Adhesive attach to card front. Cut green cardstock 6″ X 6″. Cut from outer edges 1/2″ in all around remove center square to reveal a frame. Use dimensional tape to attach to front of card. Cut pot from off white cardstock distress the pot (Vintage Photo Distress Ink used here). using loop tool from Susan’s 4pc. Tool Kit lay pot face down on molding pad and shape pulling loop tool down from top to bottom. Using a toothpick add some clear quick drying glue such as Kid’s Choice Glue add glue to very outer edges all around pot and adhere to card front leaving the top opening open. Make 3 red amaryllis using Susan’s video as a guide. Video found here. Using a little clear quick drying glue on back of stems place them in top of pot. Add flowers to top of stems and fill in at top of pot with extra leaves. Cut piece of off white cardstock 2-1/2″ X 6-1/2″ add clear double sided adhesive to one side. Cut 4 Holiday Garlands remove protective paper and add to green frame on card front. I really hope that you have enjoyed my tutorial today and will now try your hand at making this card. Be sure to visit Elizabeth Craft Designs for your supplies. Hello my crafty friends today is a Christmas card I designed for Susan Tierney-Cockburn’s Design Team at Elizabeth Craft Designs. It is a gate fold card For the tutorial please visit their blog Oh while you are there check out all their great products. Thanks for stopping by Happy Scrapping! Today my post is another card inspired by my recent tour of the Olson House in Cushing, Maine. I believe as a crafter we look at everything in a different way at least I do. I am sure some of those that were in our tour group probably thought that I was a “tad bit” crazy when I got so excited over the peeling wallpaper, cracked walls and wide painted floorboards and proceeded to take pictures of these items. The background paper I used today is from my picture I took of the peeling wall paper then printed on cardstock. When I was looking at the wall that day I could just picture some of Susan’s Garden Note Roses on that background. I have chosen Susan’s new soon to be released Susan’s Garden Note Plant Pot die using her Garden Notes Rose 2 and Jasmine from her previous releases. I also used Els Leafy Branch, Dotted Scallop Rectangles, Bead Strings 1 and Joset Designs General Sentiments stamp set. I know it is another card with roses but I just love them and I think that sometimes they can take a nice card and make it a wow card at least in my opinion. Cut white cardstock 6″ X 12″ score at 6″. Choose a printed paper for background – mine is one I printed from a photo I took. Cut paper 6″ X 6″ attach to card front using clear double sided adhesive. Note this card can be a top fold or side fold it is your choice. Cut 4 matching pieces from Bead Strings 1 ( you have a choice of 4 I chose one of the straight ones) using white cardstock with clear double sided adhesive on the back. At the same time cut 1 Dotted Scallop Rectangle using smallest die but do not back white cardstock with adhesive for this piece. Ink all edges (Distress Antique Linen used here). Attach beaded strings around outer edges. Cut 2 pots and 2 saucers from terra cotta cardstock. On 1 pot and saucer using green and white ink and makeup sponge shade to give it aged look. After shading lay shaded pot and sauce face down on molding pad. Using loop tool from Susan’s 4 piece tool kit pull loop down through the pot and saucer to give it dimension. Using clear drying glue on very edges of pot (even tiny rim area) and saucer all around attach over one already attached to card. Make sure you leave center of pot open and free of glue as that is where you will arranging your flowers. Cut 3 roses from pink cardstock. Shade centers of all petals with PanPastels Set 1 Magenta. Using green cardstock cut leaves and stems shade with PanPastels Set 1 Bright Yellow Green. Shape roses, leaves and stems using Susan’s video as a guide you can find it here. This video is very helpful I refer to it often. Cut 6 Jasmine flowers and stamens from white cardstock and stems and leaves several times from green cardstock using Susan’s Garden Notes Jasmine die. Shade center of each flower with yellow PanPastel Set 1. Lay flowers face down on molding mat and with small loop tool pull tool from top to bottom shaping petals. Turn flowers over and with small ball tool push into center cupping each flower. To form stamen spread a small amount of clear drying glue on bottom of stamen and roll up using tweezers starting at tab end.. Spread stamen out and with black marker make small dots on each stamen. Attach stamen to center of each flower using clear drying glue. Place leaves and stems face down on leaf molding pad and with leaf tool draw vein line down center of each leaf. Turn leaves over add Bright Yellow Green PanPastel and Rust PanPastels from set 1 for shading. Using tweezers pinch bottom of each leaf and lay on molding mat face down rub end of leaf with medium ball tool to add shape. Cut 2-3 Leafy Branches from green cardstock add shading using Bright Yellow Green PanPastels set 1. Lay face down on molding mat using med ball tool rub each leafy gently to give a little shape turn over and gently rub stems in several areas to give more dimension. Layout your Leafy Branches arranging until you are happy with it putting stems down in hole of pot. When happy with arrangement use clear drying glue to attach ( just a few dots on stems here and there). I cut some apart and even had some hang over edge of pot. Next add Roses and buds (once again I cut them apart cutting buds and leaves off and a little bit of bottom of stems). Add Jasmine flowers in same manner. Experiment until you get the look you want. Stamp sentiment on die cut rectangle using black ink (Happy Birthday used here but this card could be used for many things). Attach rectangle to top right corner of card using dimensional tape. Last but not least your card needs a stand to display it on Els has a how to video for making card stand here. I do hope that you have enjoyed this tutorial and that you will try making one yourself. Please visit Elizabeth Craft Designs for supplies for this card plus much more. Hello Everyone, Today I am posting a card that I designed using Susan’s Garden Notes – Geranium die and her Garden Notes – Bugs & Butterflies. My recent trip to Cushing, Maine to tour The Olson House actually was my inspiration for this card. 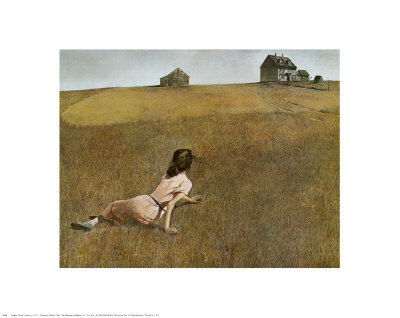 My favorite painting is “Christina’s World” by Andrew Wyeth . When approaching the house which is void of paint I noticed a window full of red geraniums. When touring the house I learned that Christina Olson always had geraniums in the kitchen window and they continue that today. Here is how I made the card. Cut white cardstock 5-1/4 ” X 10-1/2″ score at 5-1/4″ fold on score line. Using a pencil measuring in 1-1/8″ from each edge lightly draw 3″ square. Make second square inside first measuring in 1/4″ from edge of first square. Emboss with your favorite embossing folder. Score lines of both squares. Using X acto knife and ruler cut from upper left corner to lower right corner of largest square then repeat for opposite corners. Fold in on score lines of largest square then fold up on score lines of second square. Note: the following photo the card has not been embossed so it is easier to see for instructions. Cut 3″ square piece of white cardstock and attach to back side of window using clear double sided adhesive. 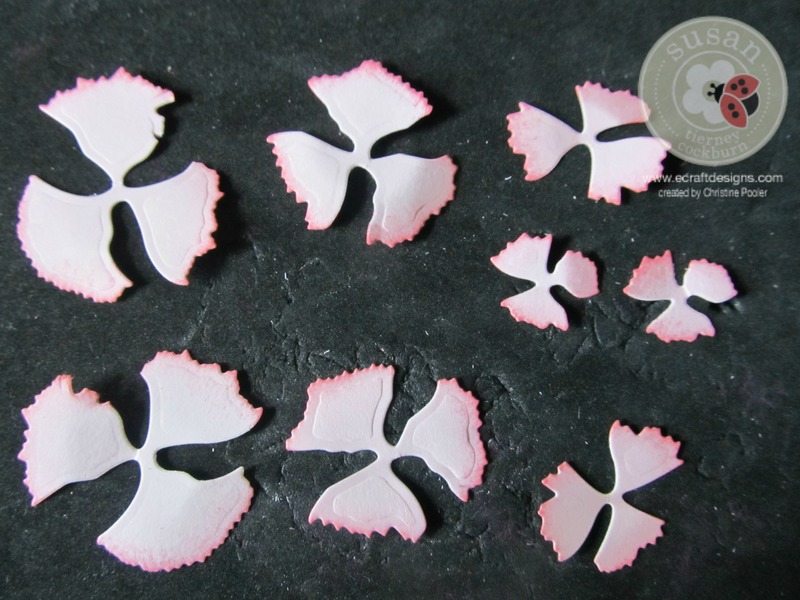 Cut 1 flower base, regular petals 3 or 4 times and tiny petals twice from red cardstock. Cut several leaves, tiny stem and calyx from green cardstock. Using Set 1 of Susan’s PanPastels shade leaves with bright yellow green and rust color. Shape petals and leaves using Susan’s 4 piece tool set, molding pad and leaf mat. Use Susan’s video as a guide in making your flowers it is found here. Cut 1 butterfly and 1 ladybug from white cardstock. Color ladybug with red and black markers. Color butterfly yellow and black or whatever colors you want your butterfly. Susan has a video on making the ladybug found here. Cut picture of your choice to fit in window opening (just slightly under 3″) adhere inside of window using clear double sided adhesive. Attach geraniums, leaves and buds using clear drying glue to lower right corner of card. Attach butterfly to upper left corner of window and ladybug to lower windowsill using clear drying glue. Cut 2 stands from cardstock adhere together using clear double sided adhesive. Emboss using embossing folder of your choice. Els has a video for this found here. I do hope you have enjoyed my tutorial today and will find a picture that will inspire you to make this recessed window card. Hello everyone weather here in Maine has been beautiful the last few days finally it has turned warm and the flowers are blooming like crazy. My roses in front of my deck really started popping open today and they are so pretty. Today my post is using a new release for Susan Tierney-Cockburn at Elizabeth Craft Designs. I have used Susan’s Garden Notes Carnation die again I love making these they are so pretty and easy. The card is an A2 card (5-1/2″ X 4-1/4″. Here is how I made the card. Using a 5-1/2″ X 4-1/4″ card base either a purchased one or you can cut cardstock 5-1/2″ wide by 8-1/2″ long and score at 4-1/4″ to form your own card base. Take green cardstock and cut to 5″ X 3-3/4″. Cut white cardstock 4-3/4″ X 3-1/2″ and emboss this piece with Swirly Curves embossing folder or embossing folder of your choice. Ink all edges of rectangles and card base . (Distress Ink – Vintage Photo used here). Using Clear Double Sided Adhesive attach rectangles to card base starting with largest (deep pink) and ending with smallest (white). Cut a Leafy Branch from green cardstock. Lay right side down onto molding mat and using small ball tool lightly rub each leaf giving it dimension. From brown cardstock cut 2-3 branches using Susan’s Garden Bouquet Stems and Branches die set. Also cut several branches from Susan’s CountryScapes – The Woods 1 dies set. On these branches add a clear drying glue to the right side of the branches and dip them into white “Prills”. Using light pink cardstock cut all petals twice. From green cardstock cut 2 stems. 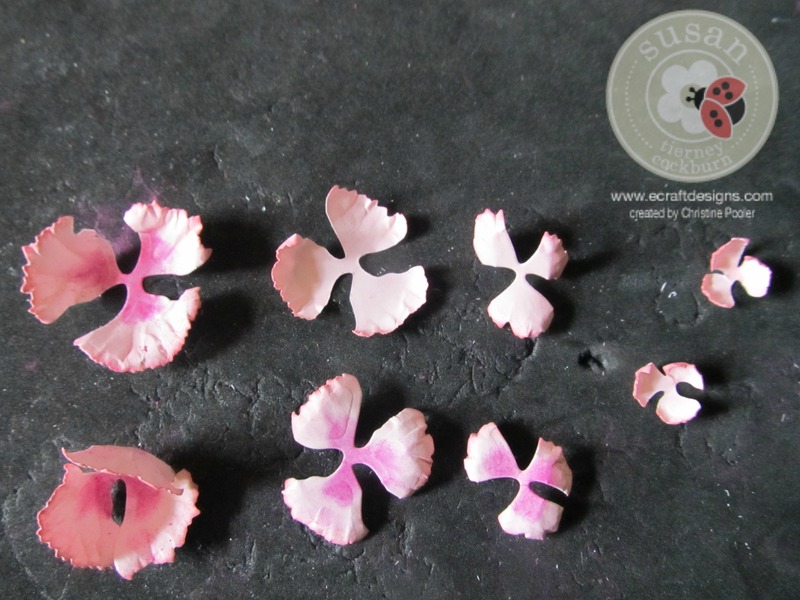 Distress all petal edges with a darker pink ink. Lay all petals wrong side up on molding mat and using small end of loop tool ruffle the edges by pressing and pulling loop from edge to center just enough to make the edge curl. Do this on all petals. Turn petals over and using magenta PanPastel shade centers of all pieces. Using the same loop tool as before finish shaping petals by pulling loop tool down through each petal careful not to disturb your ruffle. Using tweezers pinch stem end of each petal and cup center using smallest ball tool. Adhere 2 stems together using a quick clear drying adhesive. Lay stem right side down on leaf mat and using leaf tool draw a stem line down center of stem. Place on molding mat and using medium ball tool shape the “calyx” by rubbing the ball around (stirring like motion). Lay stem on non-stick surface and build your carnation. Starting with largest petals add a small dot of clear drying adhesive to calyx add your first set of petals, add adhesive to center of petals and add next set of petals offsetting a little. Continue the process until you have all 8 layers added. Using clear drying glue attach Leafy Branch to left side of card front. Attach Carnation over the Leafy Branch then add Branches. Cut scallop oval using next to the smallest die in the Fitted Frames Curvy Ovals set from white cardstock. From deep pink cardstock cut oval using next to the smallest die from Fitted Ovals set. Using smallest die in Fitted Ovals cut white oval. Ink edges on all ovals. Using Clear Double Sided Adhesive attach ovals together. Add Happy Birthday Peel Off Sticker. Attach to lower right of card front using pop dots. Cut 2 Card Stand / Easel glue together and emboss using embossing folder of your choice. I sure do hope you have enjoy this tutorial and it has inspired you to make your own card. Today my post is using one of Susan’s Garden Notes newest dies it is the Lavender. Along with this die Els’ Through the Lens -Stone Series paper was used. This card is a 6″ X 6″ tent fold. Susan has 7 new dies being released. Using 85# Soft Finish white Cardstock and Susan’s Garden Flower Coloring Kit 1 – Violet Tint and with a sponge color both sides of cardstock. You could also use a lavender colored cardstock. Cut Florets 6 times or more from violet / lavender cardstock. Cut stems from green cardstock. Place florets right side up on hard rubber mat (Speedball Speedy Carve used here) Using smallest ball tool from Susan’s Tool Kit cup each floret. Using Kid’s Choice Glue attach florets to stems. Using clear jar die cut lay on top of vellum and lightly trace around the bottom half of jar and cut out. Using light blue ink color both sides of vellum then cut to desired height to represent water in the jar. Using Kid’s Choice Glue and toothpick place glue around very edge of 2 sides and bottom of vellum (right side up) place clear jar on top of vellum lining it up – let dry. Wrap small piece of ribbon around neck of jar adhere with a drop of glue. Attach lavender to back of jar adhering with small amount of glue. Use Vintage Photo Distress Ink to ink all edges on 6″ X 6″ card base and the 6″ X 6″ patterned paper. Attach patterned paper to card front using Clear Double Sided Adhesive. Using Kid’s Choice Glue apply a small amount around the very edge of back side of jar. Attach jar to center of card front. Using white cardstock cut a tag using smallest tag in die set. Ink edges and add “Thinking of You” peel off stickers. Using same ribbon loop a small piece through hole in tag attach to center of ribbon on jar. Make a matching bow and attach that over the ends of loop.